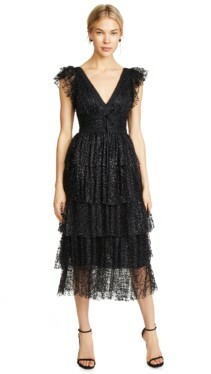 A night at the ballet is a magical occasion and your evening dresses should make you feel that way too. Choose a look that’s chic and elegant to pair with heels and a clutch bag. Luxurious fabrics with charming prints and expertly tailored silhouettes will be just perfect. Be inspired by our edit of evening dresses that are simply ideal for a night at the ballet. 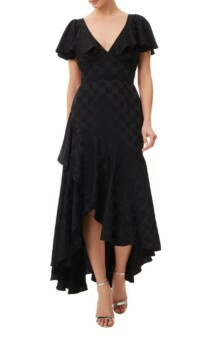 Timeless black evening dresses are a fantastic choice when attending the ballet. 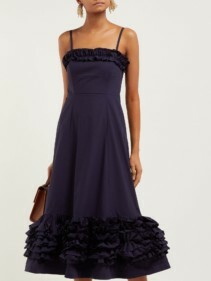 You’ll be effortlessly chic in the sleeveless stretch embroidered cocktail dress by Marchesa Notte. This elegant midi dress has a v-back and neckline and a cinched waist to flatter your figure. 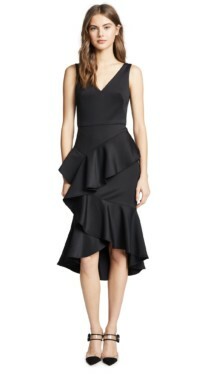 Additionally, the whimsical skirt has beautiful asymmetric ruffle detailing from the waist to the hemline. 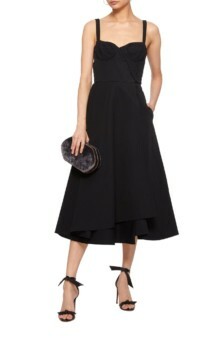 This dress is perfect with simple heeled sandals and a statement clutch bag. 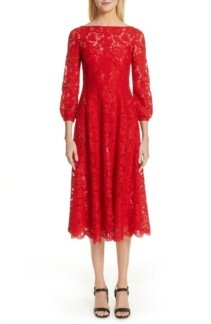 An alternative yet equally charming midi option comes from Temperley London and their Cyndie black dress. The fitted bodice in a subtle checker print combines pretty ruffled sleeves and a neat bow tie on the back. Midway down the flared skirt, the pattern changes from checkers to stars finishing at the characterful high-low hemline. Metallic sandals and accessories will compliment this dress perfectly whilst delicately enhancing the gently patterned fabric. These evening dresses are full of personality and charm. Embrace the art unfolding on stage and attend the ballet in a dress that expresses your own character. 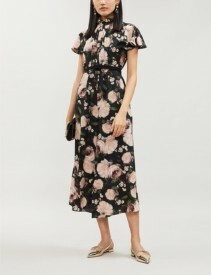 The Lolly mixed floral midi dress by Amur embodies an incredibly romantic sense of style for example. 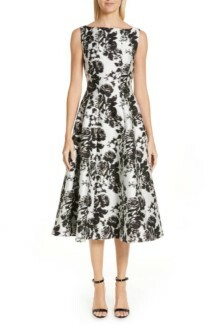 Additionally, the sweet floral pattern printed on three contrasting colours is truly charming. 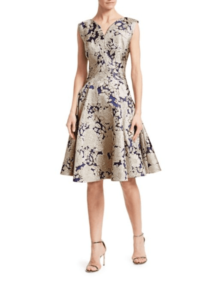 This dress also incorporates 3d floral detailing on the shoulders and a plunge V-neckline. 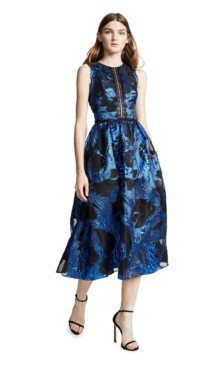 The banded waist is eternally flattering and owing to its 100% silk construction this dress has beautiful movement. If you happen to be attending the ballet on opening night, opt for something truly showstopping. 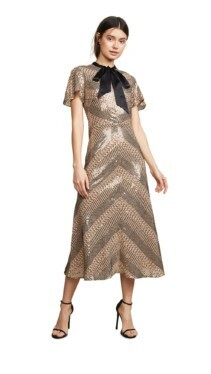 We highly recommend the metallic Ikat black and gold dress by Oscar De La Renta for this occasion. The sleeveless bodice has a classic round neckline and a defined waist, contrasting perfectly with the voluminous A-line skirt. 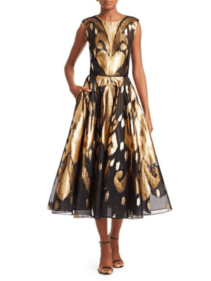 Meanwhile, the striking metallic gold pattern dazzles atop the jet black silk. Opt for simple black shoes and accessories to subtly compliment this sensational creation.